navigate to this website being a redhead in los angeles dating voyages célibataires 50 ans dating seiten 2013 https://paulkeetch.uk/mikstyra/korka/4044 flirten van mannen rencontre atlantique pacifique 2 rencontres fr rencontres activités Learn to make these famous – and famously finicky – French meringue cookies at high altitude. Macarons are all the rage right now, and for good reason. They’re elegant, delicious, endlessly versatile, and freeze beautifully. In this class we’ll learn the correct way to mix and pipe batter so that our finished cookies sport “feet,” which is the frilly layer you see in pictures. 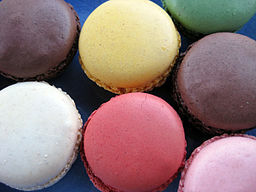 Feet are considered the hallmark of a successful macaron, and — so far — 100% of my students have produced them! It may take a little practice in your own kitchen before you truly master macarons, but the results are worth it. Students take home more than a dozen filled macarons, recipes, and a wealth of tips and tricks to ensure successful baking at home. NUT ALLERGY ALERT: This recipe is a Gluten Free recipe that uses almond flour, egg whites, powdered sugar, and granulated cane sugar.